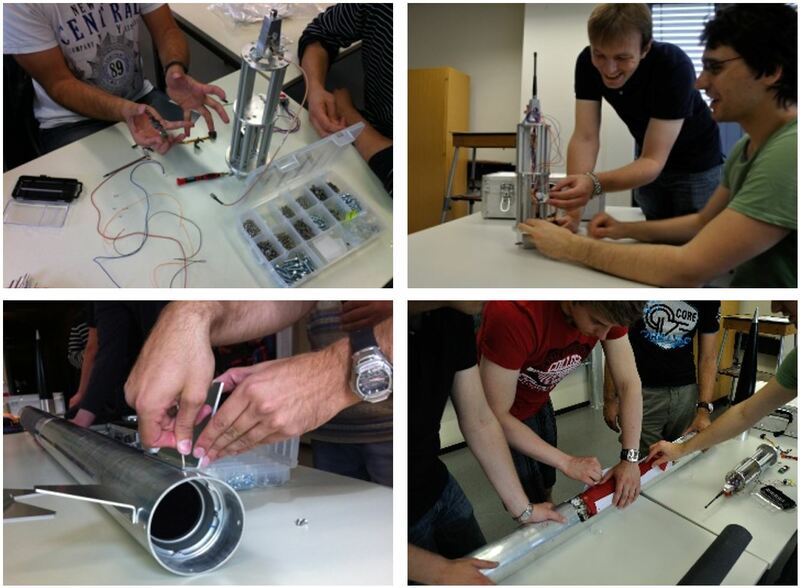 The “DECAN – Deutsche CanSat-Höhenrakete”-Project within the DLR STERN framework allows aerospace engineering students at the TU Berlin to develop, manufacture, test and launch a two-stage sounding rocket. The project offers hands-on education in the field of propulsion and launch system development and aids in training future aerospace engineers in Germany. Hence all key development steps, ranging from initial design to manufacturing and testing, are performed by students under professional supervision. The two-stage sounding rocket serves to increase students’ knowledge in the field of launch vehicle design and development as well as related engineering fields. 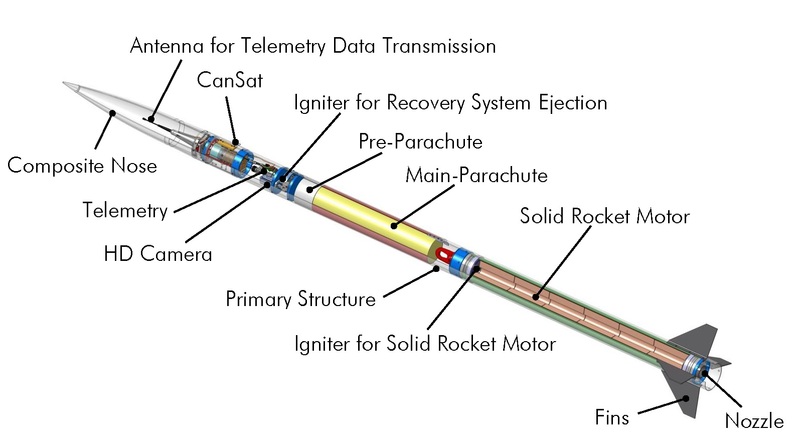 The sounding rocket will have a maximum launch mass of 150 kg and will be capable of carrying a small CanSat payload to an altitude of up to 10 km. 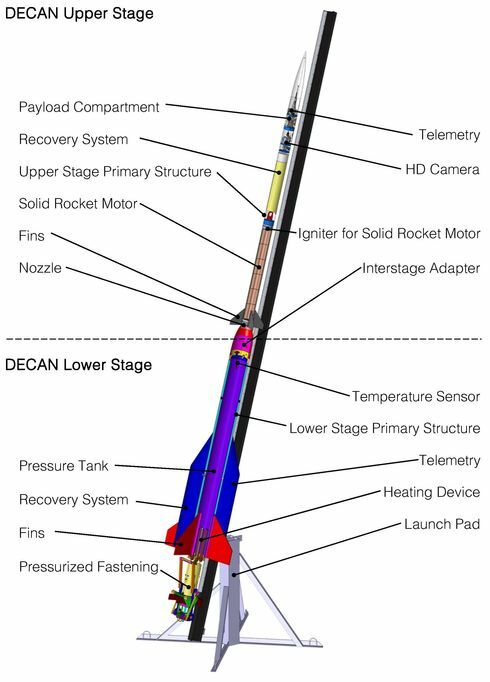 The upper stage will be accelerated by a solid propellant rocket motor and is equipped with a separation mechanism to launch and flight-test a small payload. The lower stage is powered by an environmentally friendly hot water rocket motor. The two-stage rocket will be launched from Kiruna in 2015 after successful ground testing and qualification campaigns for both stages. The first phase of the project consists of developing, manufacturing, testing and launching the upper stage as a stand-alone sounding rocket. It is able of carrying a CanSat payload to an altitude of 6,500 m. The stage is equipped with a powerful solid propellant rocket motor. The structure of the stage consists of a casing tube made from aluminium, in which the motor is fixed by two structural rings. Four fins provide aerodynamic stability during ascent. For a safe return to the ground, the stage is equipped with a recovery system. Furthermore, the stage features an electronic compartment, which houses all electronic devices and the actuator for parachute deployment. The project is integrated into the curriculum at the TU Berlin. It offers Master Students participating in the course “Project Space Systems” the opportunity to improve their knowledge in the field of space transportation systems via a practical mission. The project is supported by experts from DLR, Aerospace Institut and TÜV as well as external quality assurance specialists. Design reviews are presented to a board of independent reviewers to ensure the compliance with strict safety guidelines. All necessary structural modelling, the aerodynamic analysis and the propulsion system design are carried out by the students themselves. The calculated results are documented and verified by wind tunnel tests, structural tests and rocket motor tests based on the standards of the European Cooperation for Space Standardization (ECSS).